Har is an American multi-instrumentalist/vocalist, solo atmospheric/progressive rock artist and guitarist/bassist/Chapman Stickist for the experimental art-rock band Christus and The Cosmonaughts (Beta-Lactam Ring Records recording artists). Har has also recorded with artists such as Altus, elmodic, Cousin Silas, The Wretch, Thanatoloop and others. Har was also the former host of the weekly online dark-ambient radio show Nightscaping Radio on Stillstream.Com between 2010 and 2015. The first albums Har ever owned as a very young child were Tangerine Dream's "Rubycon" and The Sandal's instrumental surf classic "Soundtrack to 'The Endless Summer'" that he inherited from his older brother and sister...which may explain a few things about his somewhat warped taste in music. This, combined with first seeing the movie "2001: A Space Odyssey" at a very early impressionable age, was most likely the source of his life-long fascination with music and sounds that could generate vivid mental "visual" imagery whenever heard. Har started his life as a musician with formal piano lessons from age 7 through 17. At age 15 he started learning guitar and bass from a school friend of his who was learning to play at the same time, and they started their first band that only played in Har’s parent’s living room. Har’s friend eventually gave up on music after finding a deeper interest in collecting guns, selling Har his guitar and bass so he could buy ammo. At age 16 Har bought his first synthesizer, an ARP Odyssey, and a year after graduating high-school started playing professionally as a keyboardist/guitarist/bassist/vocalist in quite a few bands on the local cover-band circuit throughout the 80’s and 90's. Around 2003 Har ultimately joined forces with synthesist/sound designer/writer/Computer Music Magazine contributor Scot Solida as the epic "post-apocalyptic psychedelic art rock" band Christus & The Cosmonaughts, and its instrumental space-rock "alter-ego", The Prayer Capsule. Signed to Beta-Lactam Ring Records, C&TC released their 2007 album "From Atop This Hill" to very positive reviews world-wide. A follow-up album, "And Now I'm Seeing Red" is slated for release in 2016. 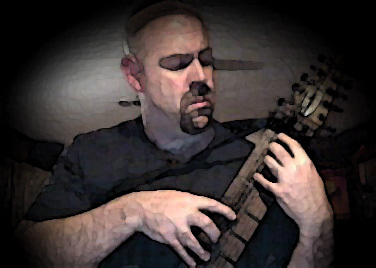 2007 also marked the release of Har's well-received first solo ambient album "Dream Tower Blueprints" performed entirely on software-processed guitar and Chapman Stick, and has had tracks from it played on NPR’s Star's End and Hearts of Space radio shows, as well as the 24/7 all-ambient online radio station Stillstream.Com and SomaFM. In 2010 Har began a five year stint as host of "Nightscaping", a weekly radio show on Stillstream.com with a focus on the more dark and mysterious corners of the ambient music universe, where he often also did live-in-the-studio improv solo performances as well as "spinning the ambient hits". Har's second solo album "Obscura" was released in June 2010. Still focusing on escewing synths for guitars and Chapman Stick (as well as the addition of 8-string bass and tabla), "Obscura" marks a shift towards mostly hardware-based processing which inspired a decidely much more dark, mysterious and sometimes ominous atmosphere. New digital-only releases by Har also now include three in his Into The Maelström series of live-in-the-studio performances as well as B'ak'tun 13 which begins to bring more elaborate percussion arrangements and vocals into the mix. These, along with downloadable versions of his two CD releases, are available at Har's Bandcamp store at: http://ambientguitarist.bandcamp.com. In 2015 Har released his first non-ambient solo release, the EP "2063, Part I: Wish", on which he performed all vocals and instruments. Har lives with his wife and three cats in Southeastern Pennsylvania.